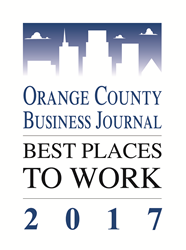 KORE1, a leading provider of IT and creative staffing solutions nationwide, has earned the 2017 Orange County Business Journal’s Best Places to Work award by placing 23rd on this year’s list. “The Best Places to Work distinction means more to us than any other award because it is the voice of our employees. KORE1, a leading provider of IT and creative staffing solutions nationwide, has earned the 2017 Orange County Business Journal’s Best Places to Work award by placing 23rd on this year’s list. This program is dedicated to identifying and recognizing Orange County, California’s best employers that have been in business at least one year and have a minimum of 15 employees. The Orange County Business Journal determines which organizations to designate as one of Orange County’s Best Places to Work through a two-part process designed to gather detailed data about each participating company. First, the employer will complete a questionnaire covering policies, practices, benefits, and demographics. Then, employees complete a 78-question survey that covers the categories of Leadership and Planning, Corporate Culture and Communications, Role Satisfaction, Work Environment, Relationship with Supervisor, Training, Development and Resources, Pay and Benefits, and Overall Engagement.